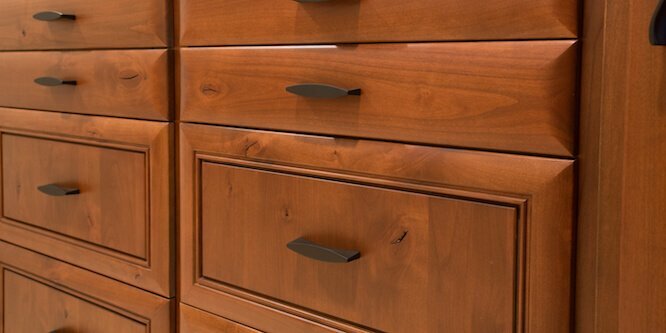 The finish you choose for your custom cabinets will have a dramatic impact on the final look. A rich stain can be used bring out the character of the wood or the cabinets can be painted and glazed to match a certain color palette or create an antique look. Haynes Cabinet Design specializes in high quality finishes that truly brings out the beauty in your home. We can capture the essence of any look through rich stains, beautiful paints, unique glazes, or any of our other specialty finishes. There are a number of approaches to find the best finish for your cabinets. If you have a certain style that’s appealing to you, we can start with that particular style and find a color that works best for your existing decor. On the other hand, if you have a certain color palette in mind, we can use this to narrow your stain, paint and glaze options. If you’re still not quite sure where to begin, browse our Gallery for inspiration. No matter the look you’re trying to achieve, Hayes Cabinet Design has the experience and expertise to create the home of your dreams. Call or contact us for a free consultation on which style works best for you.